OKLAHOMA CITY – The House Business, Labor & Retirement Laws Committee will consider sending a plan to help reduce the statewide teacher shortage to the state’s actuary for analysis when they meet at the state Capitol tomorrow. The plan developed by Republican leaders in the House provides an additional $3,000 incentive for retired educators to return to teaching. Under current law, a teacher who retires from the public school system may earn up to $15,000 from a school or school district during the first 36 months after retirement and still receive full retirement benefits from the state. After 36 months, teachers may earn an unlimited amount from a school or school district without a reduction in OTRS benefits. 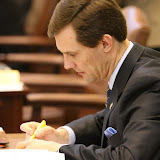 McDaniel is the author of House Bill 1061, which will increase the maximum amount that a retired teacher may earn during the first three years after retirement from $15,000 to $18,000. In order to offset the negative fiscal impact to OTRS of raising the cap by $3,000, the employer contribution rate will be increased from 9.5 percent to 11 percent for retirees who are rehired. After Republicans took over the majority in the Oklahoma House of Representatives in 2004, they pushed for the enactment of the Oklahoma Pension Legislation Actuarial Analysis Act (OPLAA), which prohibits the Legislature from passing measures that increase the unfunded liabilities of the state’s public pension system. OPLAA requires an independent analysis of pension bills by the state’s contracted actuary. If the actuary determines that the legislation will increase liabilities, OPLAA requires the proposal to be concurrently funded with additional resources, instead of raiding the principal of the retirement funds as had been done prior to 2004. The return-to-work issue was a major point of discussion last session and numerous bills were filed on the topic. Most of those bills either greatly increased the income cap or removed the cap altogether, but McDaniel said they were not considered by his committee because of their adverse fiscal impact to the retirement system for Oklahoma’s teachers. The Business, Labor & Retirement Laws Committee meets at 10:00 a.m. tomorrow in Room 432A at the state Capitol.